If you are looking to apply for a role as a Market Research Analyst then you will need to have experience in general researching and also be commercial aware of the market place and have ability to analyse the results that you have found. You could be doing a study on various subjects so you will need a wide remit of knowledge, this could vary from footfall in a department store or shops in general to how many people shop in a town to what people buy what from where etc, the list of research terms are very broad. If you are a graduate analyst then your starting salary will be around £22,000 a year. Once you have experience then your earnings will rise to between £25,000 and £35,000 a year. Seniors can earn even more up to £55,000 a year. 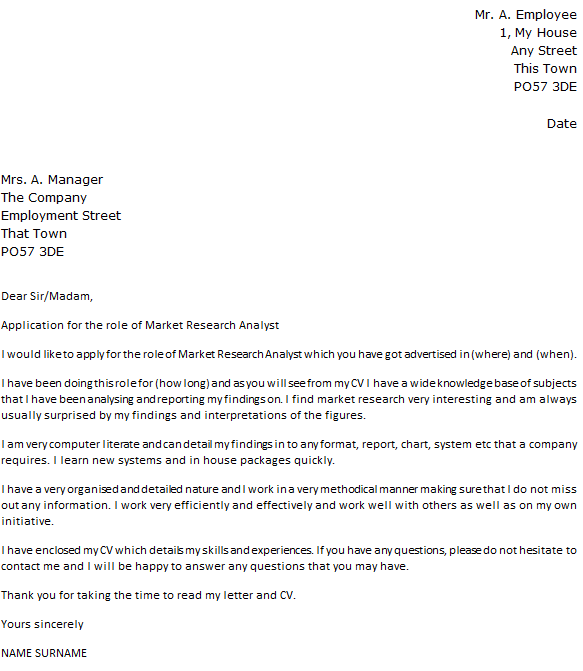 I would like to apply for the role of Market Research Analyst which you have got advertised in (where) and (when). I have been doing this role for (how long) and as you will see from my CV I have a wide knowledge base of subjects that I have been analysing and reporting my findings on. I find market research very interesting and am always usually surprised by my findings and interpretations of the figures. I am very computer literate and can detail my findings in to any format, report, chart, system etc that a company requires. I learn new systems and in house packages quickly. I have a very organised and detailed nature and I work in a very methodical manner making sure that I do not miss out any information. I work very efficiently and effectively and work well with others as well as on my own initiative. I have enclosed my CV which details my skills and experiences. If you have any questions, please do not hesitate to contact me and I will be happy to answer any questions that you may have. Thank you for taking the time to read my letter and CV.